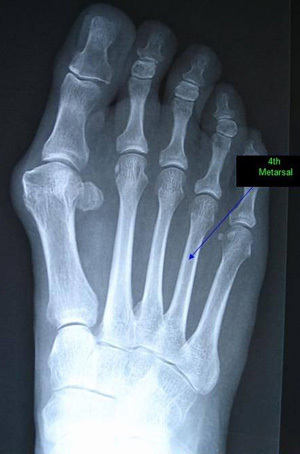 X-ray of a human foot showing the 4th metatarsal. 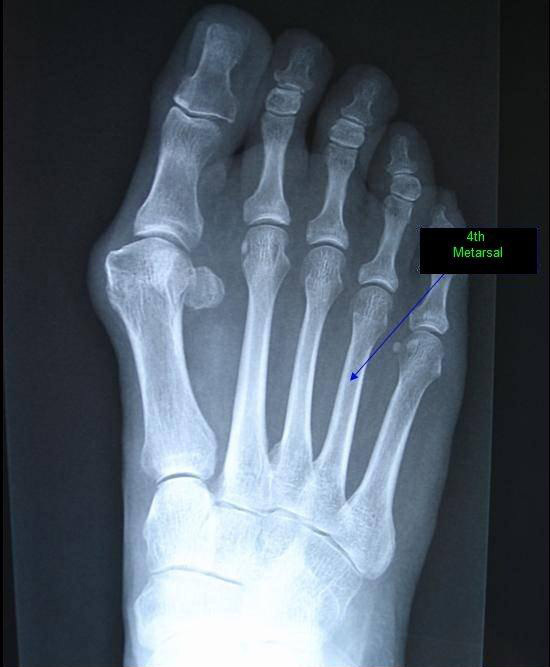 The bone in question is a fourth metatarsal (shown in a human foot in the X-ray here). It was allegedly found along with some other remains of Australopithecus afarensis, the same type of creature as the famous fossil ‘Lucy’. Found by Donald Johanson in 1974, Lucy had no foot bones or skull, but most of the rest of her skeleton was substantially present. She became a ‘poster child’ for human evolution, and was regarded as our definite ancestor. Johanson himself (who may not be the most disinterested of parties in all this) is in fact one of the co-authors of the Science paper causing all the excitement.2 This diminutive bone and its slight curvature is said to be enough to show that the feet of Lucy’s kind had medial arches, like humans do. These stiffen the feet, and are associated with habitual upright walking. The feet of creatures that spend a lot of time in trees, like apes, are not stiffened like that at all, but are able to curve and flex to grasp to an extent. These claims about the 4th metatarsal are inevitably accompanied by dates of over ‘3 million years’. As our Q and A section on dating makes plain, such labels can and should be calmly laid aside before even considering the anatomical evidence. Most fossils do not even contain radioactive materials for radiometric dating. Where associated igneous rock is dated, note that there is no measurable substance called ‘age’; all ages are calculated, using assumptions which are heavily paradigm-driven and mutually reinforcing. Whenever these assumptions are put to empirical test, by dating rocks of ‘known age’ in historical times, the results seem to always come in at ‘millions of years’ nevertheless. The history of such claims also indicates that if a deposit containing australopithecines were to be in association with volcanic rock which gave an ‘age’ much younger than where australopithecines were supposed to sit on the evolutionary chart, the specimen would be presumed to be unsuitable for the purpose, or similar rationalisation. No elaborate ‘conspiracy’ is proposed, it is a classic example of the ‘power of the paradigm’. ‘Lucy walked upright! (and we’re very happy to be able to tell you this, because up till now there’s been a lot of evidence that says she didn’t)’. Walking upright would of course not show that a creature was a human ancestor, but in any case, as will become clear, there are some real question marks surrounding this claim. First, some background to help us to evaluate it (a lot of what follows comes from a section in my forthcoming book on the Genesis history of mankind and how it relates to race and culture). Several views of the 4th metatarsal, presumed to be from an A. afarensis (though even that is not assured), that has caused all the ‘hype’. Lucy and her Australopithecus afarensis kin can be said to be part of an entire broad group which we can call the australopiths. These are important, because those in this group are more or less the only real candidates from which to draw for even partway convincing candidates for human evolutionary ancestry (traditionally called ‘missing links’). This group incorporates the australopithecines (of the genus Australopithecus). These include the famous ‘ape-woman’ Lucy (A. afarensis), and the Taung skull (Australopithecus africanus), Nutcracker Man, Mr./Mrs. Ples, and more. It also includes Ardipithecus.4 I’ve lumped the habilines (i.e. Homo habilis) in here too, because it is widely conceded that habilis is a ‘phantom taxon’; some bony fragments labelled as that should be reassigned to erectus, and others to Australopithecus. What follows is a run through the reasons why the australopiths do not qualify as the human ancestors many of them (e.g. Lucy) are claimed to be. Lucy’s kin have also been shown to have had a locking wrist mechanism typical of knuckle-walkers.8 To explain away this unwelcome evidence, evolutionists have had to resort to the idea that it was simply ‘left-over’ from a previous stage of evolution. So by the circularity that is quite common in evolutionary logic, the prints have to have been made by the ancestors of humans, which then shows that the ancestors of humans walked upright. The ‘upright walking’ claims were, till now, largely based on a set of bipedal footprints in volcanic ash, the famous ‘Laetoli prints’. 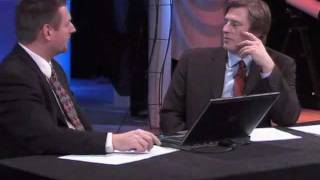 But as Dr. Russell Tuttle of the University of Chicago showed, they are indistinguishable from the prints of modern humans who walk habitually barefoot.9 The only reason they are assigned to Lucy and her kin is because of the ‘dating’ of the ash. This is more than ‘3 million years’, and modern humans are not supposed to have been around that early. So by the circularity that is quite common in evolutionary logic, the prints have to have been made by the ancestors of humans, which then shows that the ancestors of humans walked upright. Go figure. Importantly, too, these creatures were, overall, not anatomically intermediate between humans and apes. 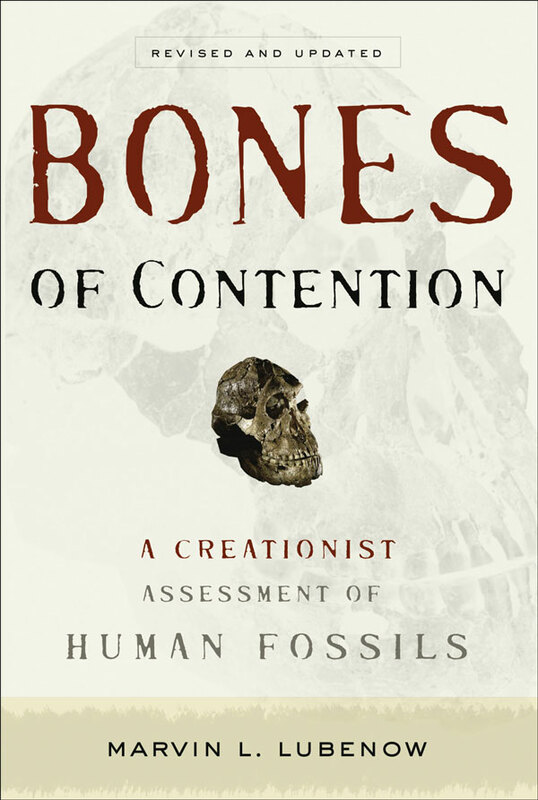 This was based on a detailed objective analysis of multiple coordinates on the bony skeletons of australopiths. The work was carried out over several years by a team led by evolutionist and anatomist Charles Oxnard. He has been Professor of Human Anatomy at the University of California at Santa Barbara, and is still Professor Emeritus at the University of Western Australia. The approach uses a computerized technique known as multivariate analysis that tries to remove the subjective element from anatomical comparisons. Most significantly, of course, Oxnard concluded that they were not ancestral to people at all. The paper to which he refers claims to show that while the australopithecines may have had posterior arches, their medial arches would have been absent. Indeed. But proper caution, and dampeners like the PLOS paper, do not make good news for newspaper writers, nor do they meet the expectations of the evolutionary-minded intelligentsia. The level of hype over this discovery, while not quite rivalling the Nebraska Man furphy, is understandable on several counts, as follows. If we evolved from apelike ancestors, then we are not accountable to the Creator God of the Bible (read Romans Chapter 1). Thus, it is important for evolutionists to be able to prop up the evidence for fossil ‘ancestors’ for us, ones that are somehow ‘in-between’ humans and the alleged common ancestor we were supposed to have shared with chimps. To this point, as candidates for such ancestors, the australopiths are more or less the ‘only game in town’. Upright walking is the human characteristic easiest to ‘sell’ to a broad general audience. The evidence for human-like upright walking in the australopiths has to date been very much the opposite of what was expected. Put all that together, and it’s no wonder that this little bone has had so much emphasis put on it. 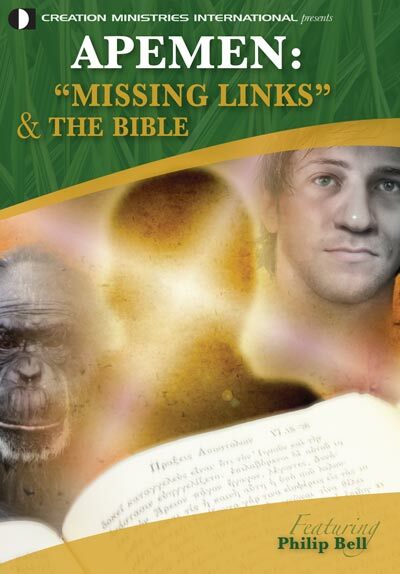 In summary, even though it would not cause too many ripples in a biblical creation model if australopiths had been upright walkers in the human manner, the evidence at this point is not consistent with this. Rather, the evidence overall seems to fit well with Oxnard’s notion of a unique mode of locomotion of these (mostly tree-dwelling) creatures when they were on the ground, not human-like bipedality at all. E.g. Recovered fossil reveals ‘Lucy’ walked upright, redorbit.com/news/science 11 February 2011. Return to text. Ward, C.V., Kimbel, W.H., and Johanson D.J., Complete fourth metatarsal and arches in the foot of Australopithecus afarensis, Science 331(6018):750–753, 11 February 2011, sciencemag.com. Return to text. Schmid, R.E., Kin of famous Lucy had feet like modern people, www.usatoday.com/tech/science, 11 February 2011. Return to text. Some evolutionists have said that it does not merit a separate genus, and is really Australopithecus; all the more reason to include it in the same grouping here. Return to text. Stern, J., and Susman, R., American Journal of Physical Anthropology 60(3):279–317, 1983. Return to text. Computerized axial tomography—a way of using plain x-rays to view ‘slices’ through a three-dimensional specimen. Return to text. Spoor, F., Wood, B. and Zonneveld, F., Implications of early hominid morphology for evolution of human bipedal locomotion, Nature 369(6482):645–648, 1994. Return to text. Tuttle, R., American Journal of Physical Anthropology, 78(2):316, 1989. See also his article in Natural History, March 1990, pp. 60–65. Return to text. Oxnard, C.E., The place of the australopithecines in human evolution: grounds for doubt? Nature 258:389–395, 1975. Return to text. Line, P, He ain’t my brother: no apparent family ties between Big Man and Lucy, creation.com/bigman, 23 September 2010. Return to text. Reaction roundup on http://content.usatoday.com/communities/sciencefair/post/2011/02/paleontology-lucys-feet-made-for-walking/1 Return to text.